This photo was taken in 1978 in the British Legion where we trained at that time. Back row: William Dillon, Stephen Dillon, not known, Neil Bremner, Adam Johnson, not known, William Bremner, Mick Cope, Jack Farquhar. Front row: M Bremner, not known, David MacFadden, not known, Gorden Buchanen, John MacAlpine?, not known. I'm sorry but I don`t remember all the names but I'm sure visiters to this site will be able to help out! Front row next to John MacAlpine, I think, is one of the Hudson boys? Back row thid left is Willie Nichol ..I think???????? Front row end is James Hudson. I think front left is Wallace Hudson, who now lives and works in Orkney. Front row, second left, is Graeme Hunter. He lives in Invergordon and is a painter and decorator. Thanks for the help with the missing names. How could I forget Wallace Hudson, he lived three doors down from us in Inverbrekie Drive. Graeme Hunter and Willie Nichol also ring a bell in my head -don`t forget this photo is 30 years old and I left Invergordon 28 years ago! Thanks again, keep up the good work. Steve. Back row 3rd from left is my uncle William Bremner. Miss him so much; good to see this picture - never seen it before. Front row middle is Colin Wright - lived in Inverbreakie Drive. Ok, 4th from the right is Joe Atcheson...better known as Big Joe from Inver g.
Just realised I meant to write: third in from the right is William Bremner - always mix my lefts and rights! It’s ok Alan, I think we all know who you meant. Great work and thanks to all of you who have refreshed my memory! I think you and I have helped this site with a great bit of Invergordon History! It’s a pity some of our friends are no longer with us. Thanks again Steve! 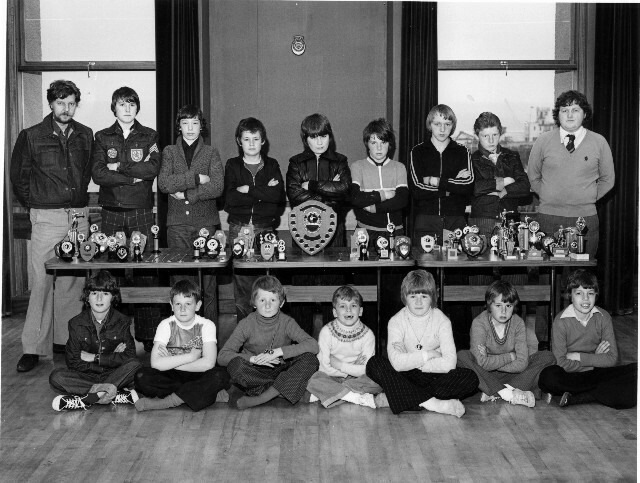 Is the Wallace Hudson referred to in the photo a junior version of the Wallace who was around the same year as me in Invergordon Academy? I left in 1964 aged 15. If it is, the Wallace I refer to would have been in his late 20s in 1978 and indeed is resident in Orkney. Wallace is the brother of Murdo, the late Clayton and Jimmy, the youngest brother. In the photo is James Hudson, Wallace's oldest son. James, thank you, I thought the dates were a bit out for it to be Wallace. Pass on my best wishes to him. He would remember me from Kildary or Inverbreakie Farm.